The Basics of Nuclear Energy — How is Nuclear Power Produced? Source: P. A. Scholle & D. S. Ulmer-Scholle, 1997, SEPM Photo CD-14, Environmental Sciences 5, SEPM, Tulsa, OK. Currently, approximately 17% of electricity worldwide is produced by nuclear power plants, but in some countries, like France, over 75% of their electricity is produced by nuclear power (How Stuff Works). The United States, on the other hand, only produces about 15% of the electricity from nuclear power. 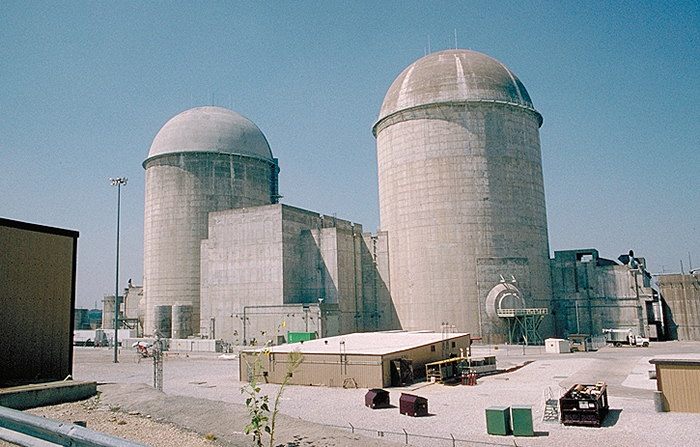 Nuclear power plants use pellets to fuel the plants. A pellet contains approximately 3% U-235 that is encased in a ceramic matrix. The pellets are aligned in linear arrays (fuel rods) that are interspersed with moveable control rods. The control rods act to dampen (or to stop) the the nuclear reactions so that the nuclear reactions do not get out of control or to service the reactor (ie. fuel rod change outs). 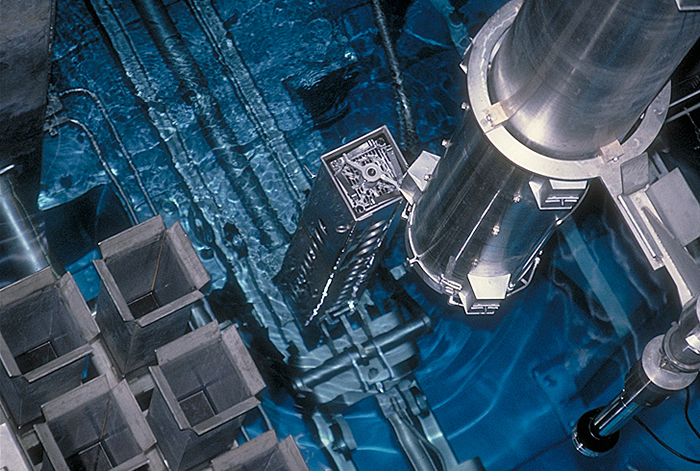 The whole assembly (reactor core) is submerged in water to help keep the core cool. A power plant similar to Comanche Peak (photo above), might have as many as 13 million pellets in the reactor at a time, and they stay there for 3 to 4 years. To optimize power production, between one third and a quarter of the fuel rods are changed out every 12 to 18 months. The reactor vessel is housed first in a radiation shield liner and then in a containment structure. This double walled design is to make certain that communities are safe from radiation leaks (unlike old Soviet style reactors). Containment structures (the large domes in the photo from Comanche Peak) are designed to withstand the impact of a large passenger planes and other possible major accidents/attacks. Nuclear fission produces heat, and this heat is used to heat water and make steam. The steam powers turbines which turn generators. The generators produce electricity. Nuclear power generates electricity much like coal- or diesel-powered plants. What is different from the other two, is that nuclear doesn't produce greenhouse gases like the burning of fossil fuels. It does produce spent nuclear fuel that is radioactive, and this has disposal problems. Go to the page, Why Nuclear? for a discussion of the pros and cons of nuclear energy. The two main types of reactors in use today are the pressurized (PWR) and boiling water (BWR) reactors. In the pressurized water reactor the water is heated by the nuclear reactions, but because the water is pressurized, it doesn't boil. The water in the reactor heats the water in the steam generator side, but it is on a different loop so they do not mix. In the boiling water reactor, the water comes to a boil due to the heat produced by nuclear fission. The water from the reactor powers the turbine. In both systems, the water is reused. The future of nuclear energy depends on safe and efficient reactor designs. In the past, the United States took the approach of having a few reactor types, but every plant was basically unique. This means that personnel can not easily switch facilities without relearning the plant's design. France, on the other hand, started out with a basic plant design. While they have improve the design with newer technologies, it still means that there is a much shorter learning curve to get personnel familiar with a new plant. There are the three types of very high temperature reactors (thermal) of the six preliminary designs that have been approved. Generally, they have graphite cores, are helium-cooled and can reach temperatures of over 1000°C. Because of the high temperatures, these reactors are also capable of producing hydrogen in addition to electricity. Also they are safer because the are built to withstand very high temperatures making accidents less likely as well as the gas being less dangerous than water-cooled plants (where the water is able to absorb neutrons). 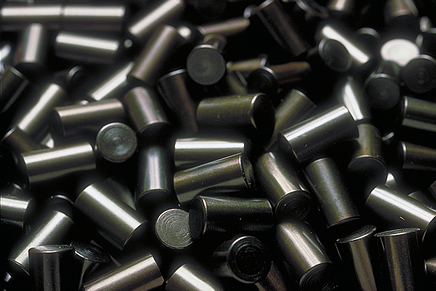 The Pebble bed VHTR uses TRISO fuel pellets for passive safety. The fuel is incased into "pebbles" of tennis-ball sized graphite spheres (see photo below) which control the nuclear reactions making this a safer design. The Super Critical Water Reactor uses supercritical water, not a gas such as helium, as the moderating medium. Similar in design to the older plants, but capable of handling high pressures and producing electricity cheaper and more efficiently. The Molten Salt Reactor uses molten salt as the main coolant. Because of the molten salt, they are considered to be safer than current reactors. They are also smaller systems, so they are faster to build and get on line. There is also no high pressured steam associated with these reactors, but there is very little experience in actual large-scale reactors (numerous experimental models do work well). 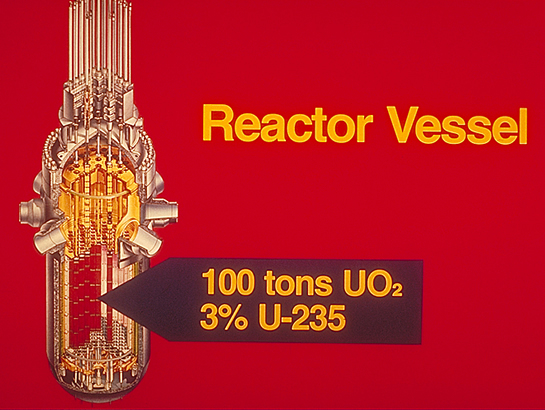 Fast Reactors depend on fast neutrons to maintain the nuclear reactions and fuel that has much higher concentrations of fissile material than the thermal reactors. Because they produce more neutrons than can be used, those neutrons can be used to change daughter materials to less harmful isotopes or produce extra fuel (breeder reactors). There are three types of GenIV fast reactors. Gas-Cooled Fast Reactors (GCFR) have a closed fuel cycle and are helium cooled. The Sodium-Cooled Fast Reactor combines technologies of a liquid metal fast breeder reactor with other fast breeder reactor technologies. It creates plutonium which can then be used as fuel, therefore the wastes never have to leave the site. It also passively safe, if the reaction starts to get out of control, it shuts itself down. Lead-Cooled Fast Reactors run in series. Temperatures get high enough to be able to produce hydrogen as an additional by product. Any mention or link regarding a product, organization, company, or trade name is for information only and does not imply endorsement by the Bureau, NMT, or the State of New Mexico (see more).